With fall here, and the holidays on the horizon, it's time to get into a decorating state of mind. Whether you want to decorate for Halloween or just want to spruce up your place to match the current season, TODAY Home has lots of DIY ideas, tips and tricks that are both kid-friendly and festive. The best part is most of these can be done on any type of budget and won't take up too much of your time. In fact, you could likely even tackle a few of these in a weekend! Succulents! These plants are (almost) impossible to kill. Give your beautiful forever-lasting plants a fall twist by planting them inside a pumpkin. You can try it with white pumpkins like those in the video above for a more sophisticated look or go for the traditional orange. 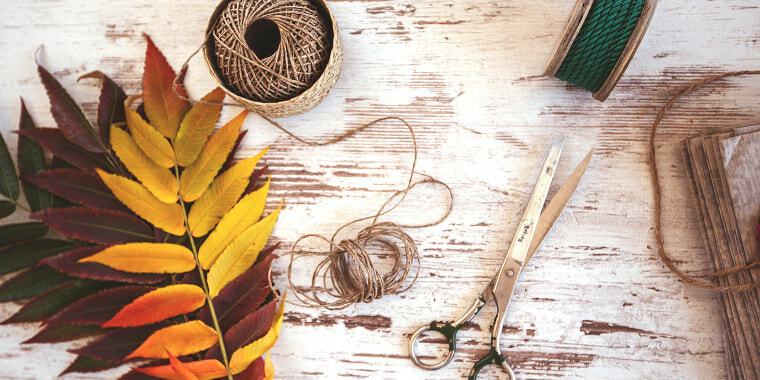 You don't have to be a craft expert to make this fall-inspired wreath — it can look great regardless of how messy or neat you make it. Now, that's a project we can get behind! Forget about carving a pumpkin! Instead, break out some paint and put your house numbers on it for an easy way to spruce up your porch for fall. Kids will love making these pine cone flowers that, when placed all together, make for a fabulous fall centerpiece. This is a brilliant way to mask a blank space until you're ready to use it. And it's simple, too! Break out the Christmas lights now and dress them up for Halloween. Then, once it's time for Christmas, all you have to do is take the tissue paper off and you're ready for the next holiday. This DIY lamp might look complicated to make, but it's actually quite easy and you can do it for just $8. The leaf embellishment make it perfect for fall. This article was originally published on Sep. 15, 2016 on TODAY.com.